High Sierra is a company which features rich and versatile adventure gear for your travels all over the world, from remote corners to your own local city streets.  Since their founding in 1978 they have committed themselves to producing the finest ‘adventure luggage’ which is not only durable and storage friendly, but also an affordable product with distinctive detail. As a drop-bottom rolling duffel, this High Sierra suitcase under review not only meets all the guarantees of the adventure friendly Sierra brand, but also well surpasses them. 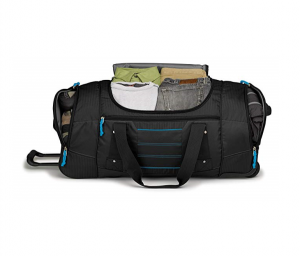 It’s a highly functional checked bag which will easily store all the clothing and gear you’re taking with you on your travels. 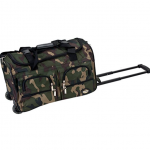 As a rolling drop-bottom duffel, this High Sierra luggage features the typical recessed wheels, telescopic handle for wheeling, additional hauling handles, and main compartment separate from the additional drop-bottom storage space. What differs between this drop-bottom duffel and others on the market is its clever design that not only makes it more lightweight (without the regular ridged drop-bottom) but also allows you to wear it like a backpack. That’s right, a backpack, which not only makes this backpack an ideal travel companion but also a great hiking buddy when you’re wearing it while backpacking through some remote section of the Amazon jungle. From just an exterior look, with added storage, a zippered front pocket, two different top-loading compartments, and carry-ability or wheel-ability, it’s clear this High Sierra duffel was designed specifically for adventure travel. What’s adventuring if you can’t take your rock-climbing gear, ski boots, hiking poles, ponchos, and food rations all in one bag? 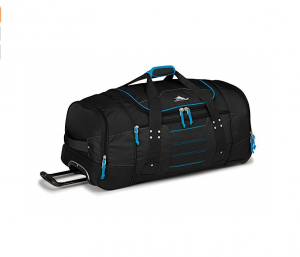 An adventure luggage brand, High Sierra knows you’ll need extra storage for all those extra odds and ends; you’ll never want for more storage with this High Sierra luggage drop-bottom duffel. First, it features two top-loading compartments, the main compartment with a U-shaped opening and the drop-bottom storage space which can be filled via two zippered compartments on either side of your bag. The overall holding capacity is around 6100 cubic inches – or 100 liters – giving you enough packing room for easily two weeks of clothing. Extra storage comes from a zippered side pocket for accessories and travel papers. For the best fit for anything you’re packing, we do suggest you start by filling the main compartment before the drop-bottom compartment, this is because filling the bottom and tow sides with diminish the available room in the main u-shaped storage. 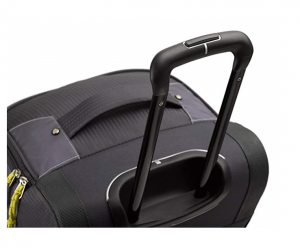 Chock full of different features to increase your fun and comfort on the go, this High Sierra luggage starts with a quick access front accessory pocket which can hold your phone, wallet, or charger when getting into the side, bottom, or main compartments will mean digging through heavy packing for one item. 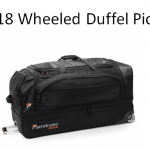 Next, not only can you haul this backpack with two durable handles, or wear it like a backpack, you can also pop it up sideways on its wheels and extend a handle for easy lightweight navigation around an airport or in the city. The wheels are highly durable in-line skate wheels, but they are also oversized so as to handle any terrain wherever you go. Recessed into the bag, the telescopic handle easily extends with the push of a button. If worn as a backpack, rather than wheeled, the hideaway straps are easy to unzipper and pull out from their bottom panel, and like the rest of the duffel are made from highly durable cross-stitching (or rip-stitch) techniques. Another feature is the great warranty, but more on that below! This suitcase is fairly light for being a checked bag; unpacked, it weighs 7.8lbs (or 3.5kg’s). However, that does mean you’ll only have around 42 pounds of weight available for packing, otherwise you’ll go over the 50-pound imposed limit for most national and international airlines. Going over that limit can result in extra fees, so unless you’re ready to pay these fees be careful how much you pack. 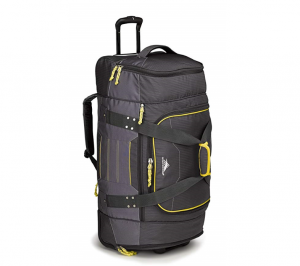 The storage capacity of this High Sierra luggage is easily enough to reach the 50-pound limit and then even go over that limit by quite a bit depending on the weight of your belongings. 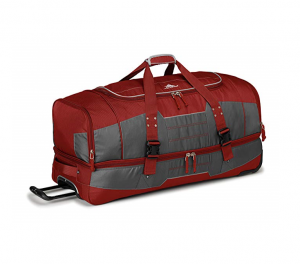 Many drop-bottom duffels feature a fabric top with a stiff aluminum, ABS, or polypropylene frame; this duffel does not. A uniquely soft-side drop bottom duffel, its durability does not come from a stiff lower compartment but instead from a unique stitching technique that uses nylon threads over a cotton canvas bag. 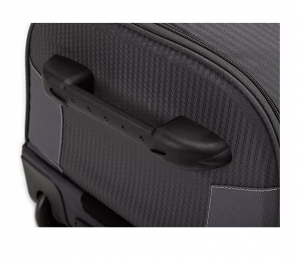 As you’ll see on this High Sierra luggage’s webpage, the fabric is called ‘mini hexagon ripstop fabric’, though this refers more to the design of the fabric than the fabric itself. The technical stitching design uses a crosshatch pattern where thick nylon threads are interwoven at regular intervals to create a strong 3-dimensional structure with added durability. This crosshatch pattern over the cotton canvas materials (which make up most of the bag) creates added reinforcement against rips and tears and also makes it so that if torn the small tears will not be able to spread. Ripstop fabrics have one downside though: they increase the weight of the bag. In this case, the increase isn’t by much, but as a buyer you should know there is a strength-to-weight tradeoff in this purchase. Other unmentioned elements include durable aluminum body zippers, in-line skate wheels (which are far stronger than spinner wheels), but a less durable neoprene telescopic handle. This High Sierra luggage style features pop color accents which add a sporty touch to the backpacking adventurer look of the bags shape. 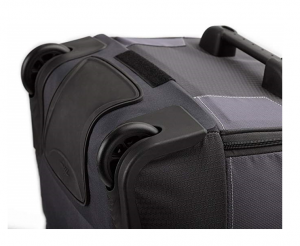 Zippered openings are stylishly designed into the top center of the bag (main u-shaped compartment) and to either side of the bag near the wheels and the handle. Each zipper features a brightly colored pull tab which will keep you from breaking your zippers and also assist in unzipping your bag in the dark. 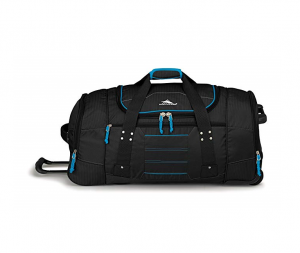 This bag comes in three colors, black/blue, brick red, and mercury (which features grey elements with yellow highlights). Although you can carry it on your back as though you’re going up into the mountains for the next two weeks, this High Sierra luggage is too large to be counted as a carry-on item. Its final dimensions are 30 x 15 x 14 inches, where the carry-on size limit for most national and international airlines is typically between 18 and 22 inches. At 30 inches you’ll have the benefit of being able to pack everything you need for your trip and more, but the drawback is that you’ll have to pay for this bag to be checked and you’ll need to make sure you check your bag with your airline before security. Checking your bag at the gate can result in extra unwanted travel fees for you, so keep that in mind! High Sierra feature a great 5-year limited warranty on all their wheeled products. This warranty includes a repair evaluation with an Authorized repair center that is ready to answer your email at any time. Make sure you email them before you send your bag, and also understand that all shipping costs will be out of your own pocket. However, if you’re suitcase is determined repairable under their warranty, all repairs and return costs will be paid for by High Sierra; if not reparable you’ll be contacted to receive a comparable replacement. 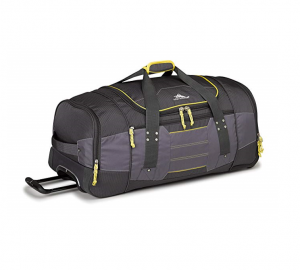 By and large the High Sierra Ultimate Access 2.0 Drop Bottom Wheel Duffel falls under the umbrella of ‘adventure bag’. At just a glance it is clearly designed for adventures in all corners of the world from high mountain tops to busy urban streets. It wheels with a telescopic handle but it also has straps to be carried like a backpack. It’s lightweight but it features an extremely durable ripstop fabric design. Whatever gear and clothing you take on your adventures, this bag has enough storage to fit your average packing with much more to spare. You’ll never want more packing space, easier portability, or a stronger design if you’ve purchased this amazing product from High Sierra. Ripstop fabric design for added durability; features nylon threads. Wheels with handle, or can be carried like a backpack. Central storage, two zippered side storage pouches, and a drop-bottom storage area. Packing bottom and sides first decreases the amount of room in the central packing area. Neoprene telescopic handle is not very durable.